Designed and manufactured to perfection, our company is considered as one of the renowned and preeminent manufacturers and suppliers of Reaction Vessel. Designed using premium metallic alloys, these have accurate dimensions, sturdy construction and can withstand temperature fluctuations. 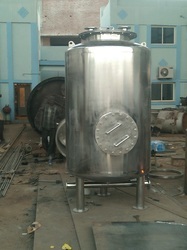 Designed and manufactured to perfection, our company is considered as one of the renowned and preeminent manufacturers and suppliers of S.S Limpet Chemical Pressure Vessel Designed using premium metallic alloys, these have accurate dimensions, sturdy construction and can withstand temperature fluctuations. Designed and manufactured to perfection, our company is considered as one of the renowned and preeminent manufacturers and suppliers of Low Pressure Chemical Vessel Designed using premium metallic alloys, these have accurate dimensions, sturdy construction and can withstand temperature fluctuations.